Animal Wildlife | Horseshoe Crab | The horseshoe crab (also known as the king crab), is a hard-shelled invertebrate found on the sea floor in warmer climates. 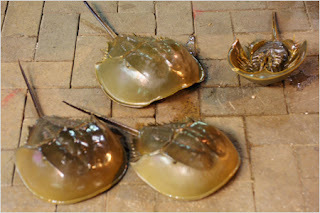 Despite it's name, the horseshoe crab is not actually a crab (or crustacean) and is in fact more closely related to arachnids such as spiders and scorpions. There are four different species of horseshoe crab found inhabiting the warmer shallows off the coasts of India, Japan, Indonesia, the eastern USA, and the Gulf of Mexico. The horseshoe crab has a hard outer shell, five pairs of legs and a long, thin tail which the horseshoe crab uses for changing direction whilst swimming rather than as a defensive weapon. The appearance of the horseshoe crab is thought to have changed very little from when it first evolved around 500 million years ago. 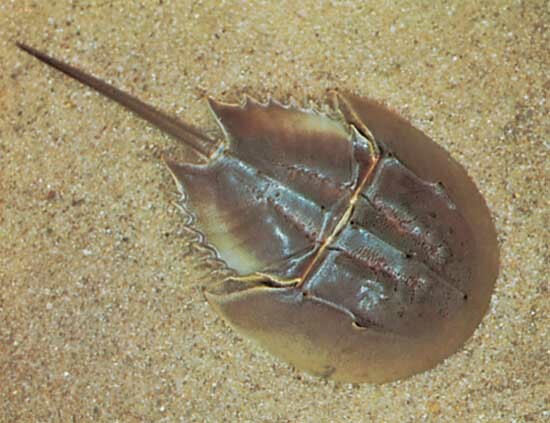 Horseshoe crabs breathe using book gills, which are thin plates found on the abdomen of the horseshoe crab. 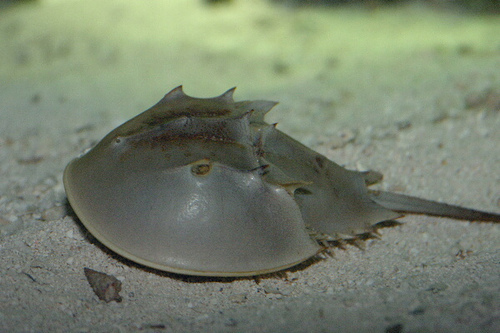 Horseshoe crabs are generally nocturnal animals, coming out of the shadows in the darkness in order to hunt for food. As carnivorous animals, horseshoe crabs only eat meat including sea worms, small molluscs and crustaceans. Thanks to their armoured casing, horseshoe crabs have few natural predators and are primarily hunted by sharks and sea turtles. 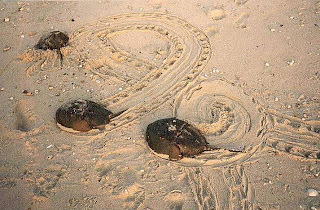 Humans also widely hunt the horseshoe crab around the world, along with coastal birds that pick the horseshoe crabs out of the shallows. Female horseshoe crabs are known to lay between 60,000 to 120,000 eggs at a time. After mating, the female horseshoe crab lays her eggs into a hole in the sand which she then covers up to protect them. 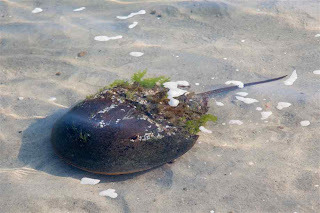 Today, the horseshoe crab is still found widely along the world's warmer coastlines although horseshoe crab populations in certain areas are suffering from high levels of water pollution and over-fishing. 0 Response to "Horseshoe Crab"